This web page is to illustrate and describe flowers seen on Honeyguide's La Mancha holidays that are tricky to find in field guides. Photographs were taken in May 2017, plus one from October 2014. They are split, for ease, between those seen in La Mancha Húmeda and Serranía de Cuenca: the majority are in the latter. The best flora for La Mancha Húmeda is Mediterranean Wild Flowers by Marjorie Blamey and Christopher Grey-Wilson (originally HarperCollins, now Domino Guides published by A & C Black. ) This section includes some in Blamey/Grey-Wilson but included as they were unfamiliar to me so may be considered unusual or notable by others. Three flowers in farmland near Belmonte. All three of these are in Blamey. 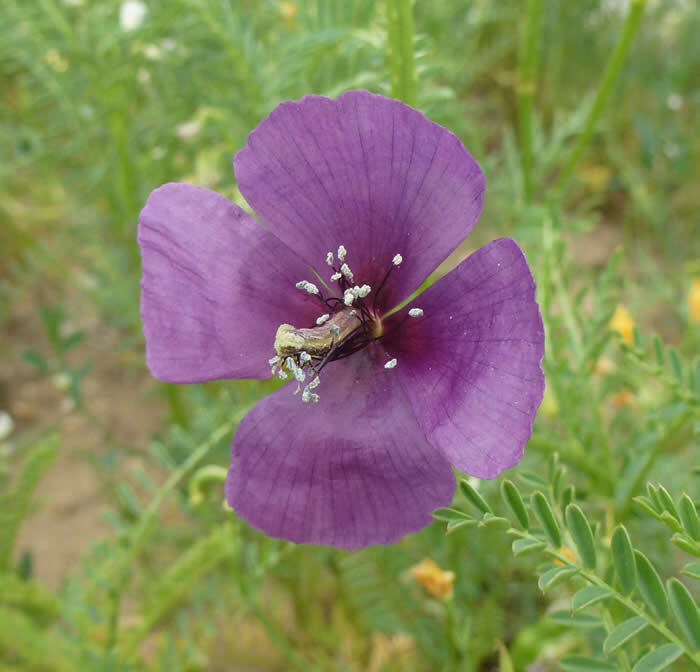 Roemeria hybrida is an usual purple poppy. Torilis purpurea (elsewhere regarded as a subspecies of Torilis arvensis, spreading hedge-parsley). Vaccaria hispanica is a pink but has the odd English name of cow basil. The ridges on the calyx are distinctive. Lavatera triloba, musk-scented lavatera, is in Blamey but there shown as deep purple. Other photos online show it as rose pink. Quite common and obvious by the lagoon at San Juan. No book is right here: a few flowers are in the Mediterranean flora, a few are alpines, a few are in the northern Europe books (e.g. Fitter, Fitter & Blamey). 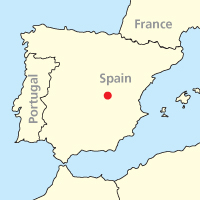 Most were identified with the help of the website Flora silvestre del Mediterráneo. Three toadflaxes ... more or less. Left: Linaria aeruginea. 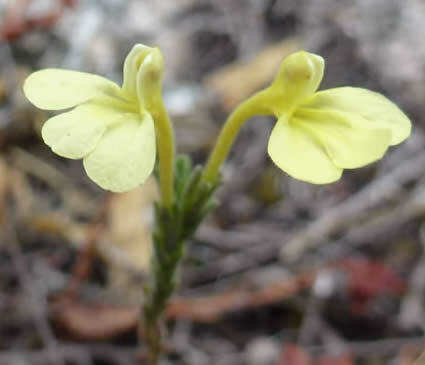 It's extraordinary that such a beautiful toadflax needed an internet search to find an ID. Centre: Antirrhinum pulverulentum, widespread including at Cuenca. Right: Sarcocapnos enneaphylla (right): we'd already met these two in autumn but they were also in full flower in May. 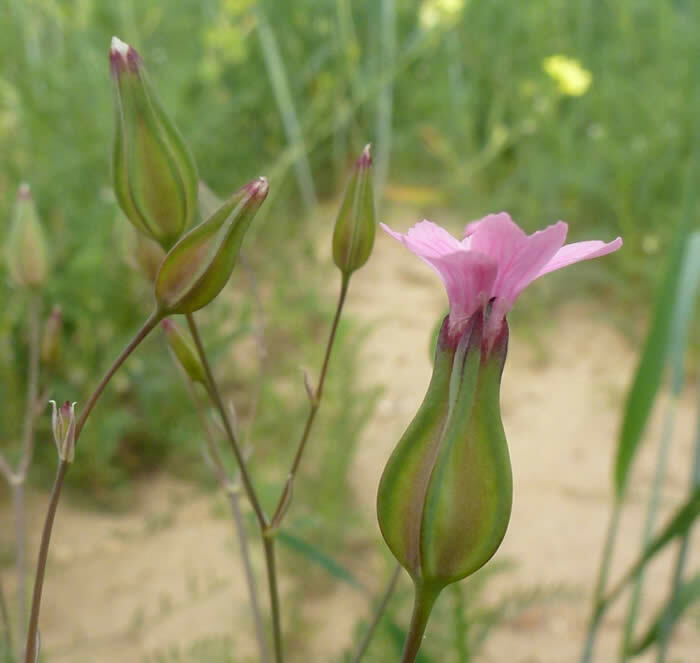 Sarcocapnos enneaphylla looks like a snapdragon but isn't: this unusual member of the poppy family has the local name of boca de dragón - dragon's mouth. 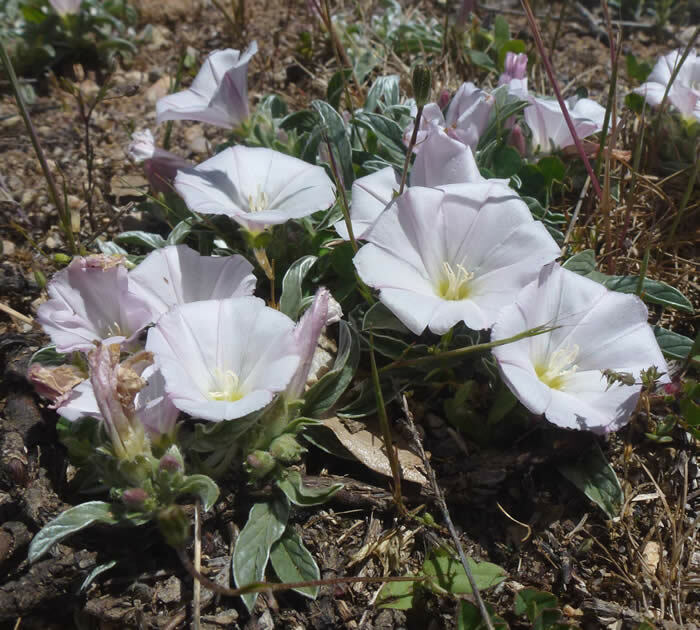 Left: Convolvulus lineatus at Uña Lake. In Blamey but no picture. Right: Thalictrum tuberosum. This meadow-rue was at Los Callejones, not in books. Three vetches: Vicia onobrychioides (in Blamey, no picture), Vicia pannonica (in Blamey) and Vicia tenuifolia (not in Blamey). Alyssum spinosum - spiny alison, you could say, was especially obvious at the Devil’s Window viewpoint. It grows in the style of a browsing-resistant plant of the garrigue: low-growing, compact, spiny mounds. Galium lucidum, on limestone by a walk by the source of the Júcar River. A good-looking example of the sometimes underwhelming bedstraws and goosegrasses. An English name might help, but that's a challenge: translated it's shining bedstraw, but that's already used for a different species in N America. Some orchids now as we like them and generally they are easier! The first two are straightforward. Left to right: Yellow bee orchid Ophrys lutea and early spider orchid Ophrys sphegodes, the latter unusually (but not exceptionally) here with white sepals, instead of green. 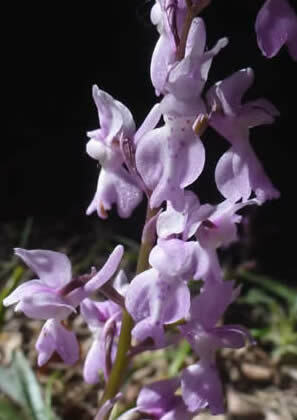 The third is Orchis cazorlensis, "Apparently endemic to the mountains of central and southern Spain" says Delforge. This specimen of this rather local species was at the source of the River Cuervo. It's distinctly paler than the one previously photographed by Pau Lucio and shown on the La Mancha page. 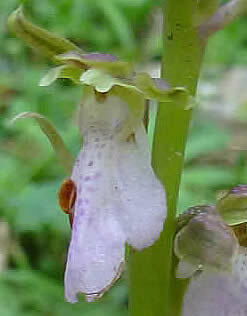 Far right is Orchis olbiensis (sometimes Orchis mascula subsp. olbiensis), an Iberian form of early purple orchid. More on Iberian orchids. Spikes of Teucrium pseudochamaepitys were fairly common on dry hillsides in both La Mancha Húmeda and Serranía de Cuenca. It's not in field guides. Iberis ciliata. Looks like a garden candytuft and that takes you to the right genus. ID from the internet. Lagoon of Manjavacas, in La Mancha Húmeda. Not in Blamey. Cachys trifida. Yellow umbellifers can take some pinning down to species! At Las Tablas de Damiel. In Blamey, no picture. Geum sylvaticum at the source of the River Cuervo. Obviously a Geum so should be easy ... but only by looking at Geum photos online as it's not in books. Armeria filicaulis. This thrift, at Los Callejones, ID from web references. Leucanthemopsis pallida subsp. virescens. This pretty little composite was quite common at Los Callejones de Las Majadas, but it was tricky to name. It's in Polunin as Tanacetum pallidum - so related to tansy. Achillea ageratum. In Blamey, no picture. Anthyllis montana subsp. 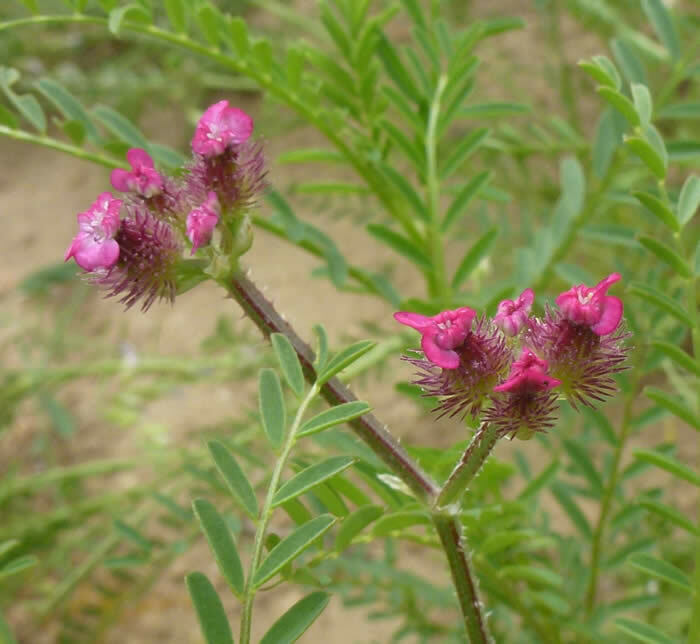 hispanica - Spanish subspecies of mountain kidney-vetch. At Los Callejones. Odontites longiflorus, Cuenca, October 2014. A bartsia. Honeyguide's Iberian orchids web page. Best website for flowers of Spain: Flora silvestre del Mediterráneo, referenced for several of this page's IDs. Photos and text by Chris Durdin, June 2017.